For most of us, it’s just an ordinary Tuesday. For our ancestors this was one of the most anticipated festivals of the year. Beltane or May Day as it was later called, celebrated the 1st day of May and with it the stirrings of spring. Great excitement would have taken over our communities as we built the Beltane fire from our nine indigenous sacred timbers and got ready to jump over its flames for luck and health. Cattle were led between two fires to protect them from illness and the Maypole was erected in the centre of the village, decorated with bright ribbons and danced around. Then there was the frisky side to this ancient celebration of life! In pre-Christian times people took off into the woods for an illicit fling on Beltane night – children born of these meetings were said to be blessed. That night spent in the woods almost certainly was! 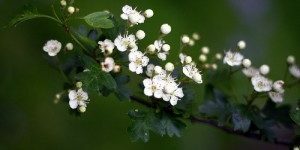 It is the Queen of the May, otherwise known as the Hawthorn that is the plant most connected with these times. Associated with fertility and good fortune, it was the plant to oversee relationships of the heart and many a handfasting would have taken place on this day, with the bride’s bower decorated with the frothy white blossoms of the Hawthorn tree. Nowadays, we are less likely to look to Hawthorn for our fertility rites but for the herbalist, Hawthorn still has much to do with the heart. It is the herb of choice to normalise blood pressure. Hang on, come again? It can normalise blood pressure. That means it lowers high blood pressure and can raise low blood pressure bringing the body back to homeostasis. Not only that, but clever Hawthorn has been shown in numerous trials to be safe and effective for Congestive Heart Failure (CHF) without the distressing side effects many medicines can cause.